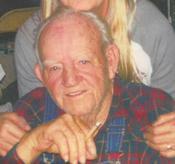 Graveside services for Mr. George Truitt Buckley will be held on Sunday, July 24, 2011, at 3:00p.m. at Union Cemetery near Freestone. Bro. Scott Matthews and Minister Ricky Misseldine will officiate. Mr. Buckley passed away early Sunday morning, July 24, 2011 at his farm near Freestone. He was born on October 20, 1926 in Goodlett, TX to Vessie Houston and Bridget Mae Buckley. Mr. Buckley served in the U. S. Marine Corps. He loved all his children, grandchildren, and great-grandchildren. Throughout his lifetime, he achieved many things including owning his own welding shop, racing horses, ranching and farming. You could usually find him on his tractor, digging a new pond, hatching a batch of chickens, fishing, gardening, or telling stories and playing jokes on his grandchildren. He dearly loved his “angel” & wife, Alice Buckley and was a devout believer in Jesus Christ. “Now he walks with his angel on one side and his Father on the other”. Mr. Buckley was a wonderful father, grandfather, husband and friend. He was always ready to help those in need or fix something that was broken and will be sorely missed. He is survived by two sons, Danny Buckley & wife Cheryl of Baytown and Craig Buckley & wife LaDonna of Humble; seven daughters, Betty Rice & husband Jimmy of Alabama, Rose Johnson & husband Richard of Donie, Louise Rice & husband Neil of Alabama, Judy Niekamp & husband Don of Fairfield, Katherine Koepp & husband Dwight of Cross Roads, Martha Garduno & husband Johnny of Conroe, and Kimberly McAdams & husband Paul of Streetman; numerous grandchildren and great-grandchildren; one sister; other relatives and friends. Mr. Buckley was preceded in death by his wife, Gladys Alice Buckley.